Pugs can require a decent amount of ongoing care. Here are some general guidelines to follow to make sure you’re not missing anything! Those wrinkles on your pug’s face are commonly referred to as folds. There is a lot of stuff that can accumulate in there! Their faces are fairly flat, so when they are sniffing the carpet, eating or drinking out of their bowls, they are right up in everything. Stuff gets crammed up there! It is important to make sure that you clean out the folds in order to ensure your pug doesn’t get any infections. Start a routine immediately in order to keep your pug clean and smelling fresh. To clean them out, grab a Q-Tip, a cup of warm water and some Vaseline. Dip the Q-tip in the warm water and run it in the folds above the nose and below the eyes. Once you have cleaned out the gunk, apply a thin layer of the Vaseline. Your pug’s nails will grow pretty quickly. Depending on how comfortable and squeamish you are, you can either do it yourself or have your pug taken to a specialist. 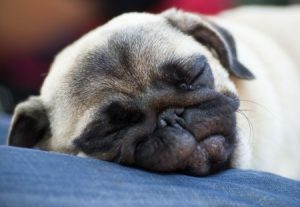 If you’re looking to do it yourself, it might be best to do it while your pug is in a deep sleep. The thought behind this is even if they wake up they will be less likely to put up a struggle. To avoid cutting too far, you could only clip the curved part of the nail and make sure you have a steady hand. Their nails should be clipped every two weeks. If the nails are too long then they can hurt your pup and cause them to struggle when walking. The teeth are hands down the most overlooked aspect of caring for any dog. Milk bones and other chewable bones are used only for minimal maintenance. You will want to manually clean your dog’s teeth from time to time. If you use yummy flavored toothpaste, then they will welcome you when you try to brush their teeth. If you are having a hard time with this, most vets would be willing to help out. You should brush your pug’s coat twice a week in order to keep them looking well kept. Some will even do it daily in order to keep the level of fur around the house to a minimum. The best approach is to use a brush with stainless steel bristles. Gently brush the fur in the direction that it grows.